This week we have two new features to share that’ll help you boost your conversions not only on your own site, but around the web. 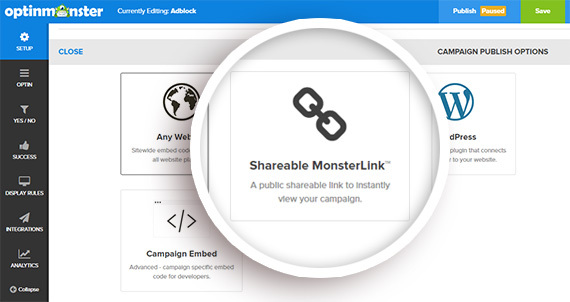 A Shareable MonsterLink is a unique link you can use to share any OptinMonster campaign. You can share your campaign link through your email newsletter, on Facebook, your social media profiles, and more. 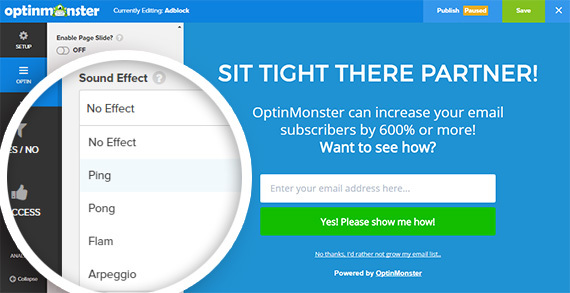 When a visitor clicks the link, they’ll be taken to the standalone page where they’ll see your OptinMonster campaign. You can share any of your existing campaigns as a shareable MonsterLink, and use any of the features of OptinMonster including success themes to engage even further with your audience. See our doc for step by step instructions on creating Shareable MonsterLinks. We’ve also added a brand new Sounds Effect feature to help you create even more attention grabbing campaigns. This feature complements our InactivitySensor which helps you convert disengaged visitors into subscribers. When a user stops interacting with your website, InactivitySensor triggers a targeted campaign. You can combine that with the sound effect to help capture the user’s attention and bring them back to your website, so you can convert them into subscribers. You can choose from four different sound effects to add to any type of triggered campaign. We will be adding more sound effects in the near feature along with several other features. Make sure to subscribe to our newsletter and follow us on Twitter and Facebook to be the first to find out. Ready to create your own MonsterLinks to collect subscribers and customers from around the web? Click here to get started with OptinMonster today.